Susanna is a travel nanny. She specializes in traveling overseas with her clients and looking after their young charges in unfamiliar surroundings–including Japan. She read my book and emailed to ask if I wanted to meet up before we left. Did I ever. “Breakfast is going to be tricky,” said Susanna. Everything I know about Japanese breakfast is a stereotype: dried fish (himono), rice, miso soup, and natto. Maybe some grated nagaimo, which is a type of tuber that turns sticky and runny when grated. In A Cook’s Tour, Anthony Bourdain describes this type of meal in excruciating detail, comparing the nagaimo to all sorts of secretions. Anyway, breakfast turned out not to be tricky, and I didn’t get any natto or himono, not that I would have minded. Our hotel had a choice of Western or Japanese breakfast. Iris got the Western, which featured a sausage link, potatoes, salad, scrambled eggs, and a sweet roll. “That was a good sausage,” she said. “I think it was a fake meat sausage, like for vegetarians.” I’m sure this was not the case, but I couldn’t convince her otherwise. She also got a bowl of strawberries, which she doused with cream and sugar and congratulated herself for inventing a new taste sensation. Meanwhile, my breakfast was awesome! Rice, nori, two kinds of pickles, miso soup, sauteed fresh fish, and soybeans. I could eat this for breakfast every day, and for the rest of the week, I did. I think it was $13. If you got this at an American hotel it would be $30. Oh, and there was tea. There is tea everywhere. Tokyo is a freely flowing tea fountain. There was tea on the plane. It wasn’t very good, but it was certainly better than any tea I’ve had on a plane before. But everywhere we went, there was wonderful bancha or sencha, usually complimentary, with the right amount of leaf dust at the bottom of the cup. I felt exactly like a coffee lover from nowheresville USA vacationing in Seattle: you mean I get to drink this stuff everywhere, all day? The hotel breakfast kept getting better. Every day, a different fish, different vegetables. There were always both pickled and cooked vegetables, which made me extremely happy and gave new meaning to the phrase “part of this complete breakfast.” Simple boiled potatoes one day, a complex vegetable stew another. One day I got a fried egg. But on our last morning, just to be different, I took Iris to Denny’s. This entry was posted in Uncategorized on April 17, 2010 by mamster. I love that Japanese breakfast menu so much. If I could get Japanese breakfast in Seattle, I would find a way to get it as often as possible. I would get a second job or cancel Netflix or something. I know it sounds crass, but I have heard hilarious things about Japanese toilets. What is the strangest “function” you found? I would love that Japanese breakfast, too! I hate eating breakfast when travelling in the U.S. (unless it is late enough that they will let me order off the lunch menu), but adore the interesting breakfasts in the rest of the world. 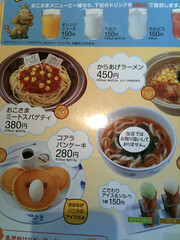 I would be blissfully happy eating breakfast in Japan. No omelets and sausage to deal with, thank goodness! I’d love to hear about your train bentos, and about your stay at the ryokan. When I was in Japan, it took me about two days to get used to the comparatively salty breakfast (all that miso!). And then I decided that, really, green tea, miso, and rice was the perfect breakfast. I also loved the toilets that did all kinds of crazy things — not just seat-warmers but tune-players, chirping birdies and plashing fountains and the like. caleb, I didn’t play it, but somebody told me they have the same game at GameWorks in Seattle. Will investigate. Anita, I will be doing a full post about those things. Lauren, I have not turned up Japanese breakfast in Seattle, just a lot of people saying, “They used to have it at…” and they don’t anymore. Alex, we never encountered any super-enhanced toilets of the future, just moderately spiffy ones. On the shinkansen, there was a button to raise and lower the seat. I submit that if you connected this function to an iPhone app, men would never leave the seat up. In our hotel in Kyoto, the toilet would make a fake water-running sound when you sat down, for privacy. It also had an integrated bidet, which we didn’t try. Nearly every toilet had a dual-flush mechanism–big flush or little flush, depending on what’s necessary. I would like to have this feature at home; it would save us a bunch of cash. More about making this trip with Iris and the advice that Susanna gave, what worked and didn’t, in terms of your sanity and the particular challenges of very long distance travel with kids. What you’d do differently. I love natto–I could eat it every day! Did you try the coffee in Japan? Despite what people might think its pretty good. I still buy JCC brand instant coffee when I can get it because it comes in handy on those days when you just don’t have it together enough for a French press. Oh and did you try the vending machines with all the weird sodas and “manly” coffees? It’s a thingy to convert your regular toilet to a dual-flush toilet! Awesome. I don’t have one yet, but I hope to get one soon. Did you try any pizza with squid or corn on it? I saw those on the menu at Shakey’s in Japan. Did you not know about Yoshinoyas? They have awesome Japanese-style breakfasts (but if you were at a ryokan, they serve you breakfast anyway). What’s up with breakfast salads? I never understood them. Hey, nomitai, we didn’t have any pizza, although I took a photo of some plastic pizza in a window. We had dinner at Yoshinoya one night. Iris loved it, of course. I loved the fact that I thought I might be overdoing it with the pickled ginger, and then I looked around and saw that everyone else was piling the stuff on like it was the last batch on earth. The posts and photos bring back great memories. I spent 6 weeks in Japan my senior year of college. I loved the breakfast, too, but couldn’t really get into the raw egg dropped in rice. And learning to get around, at least nominally, on the trains by myself, not knowing the language, was a big accomplishment. One of my husband and daughter’s favorite things to do is make homemade sushi. And I still remember how almost every restaurant had plastic models of the food in the window.